Blasting nozzles are fighting Erosive wear, and, to some degree, Abrasive wear. The wear regimes change when the grit impinges on the nozzle at a small angle (e.g. near the outlet) compared to a large angle (e.g. in the inlet area). A material which works really well on fine grits may not work nearly as well when coarse grits are fed down the same pipe, even though the materials are the same in both cases. 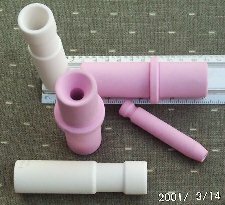 The least expensive high performance nozzle material is Alumina ceramic. The grade used is usually around 95% purity. Not all 95% aluminas are created equal! The glass-forming balance of the material which is not alumina has to be chosen carefully to produce a material with good abrasion resistant properties. If the glassy grain boundaries are too brittle, then the full wear resistance of the alumina material will not be realised, since whole grains of the ceramic will be removed from the surface, instead of being gradually worn away. Alumina nozzles are usually formed by isostatically pressing powder onto a pre-shaped mandrel, which determines the I/D profile. The compacted block of powder is removed from the mandrel and may be shaped on the O/D by turning or dry-grinding, since the powder is still easily workable in this 'green' condition. The preform is now sintered and shrinks on length and diameter by around 20% - a relatively massive change in size - while the material densifies itself to near theoretical density of around 3.75 g/cc. Due to the large shrinkages involved, tolerances are not normally better than �1.5% or �0.2mm, whichever is the larger tolerance. If tighter tolerances are needed, then diamond grinding is the only way to machine the material. Tungsten Carbide nozzles wear more slowly than Alumina nozzles, but, size for size, are considerably more costly. Aegis Advanced Materials Ltd supply various types of ceramic and also tungsten carbide nozzles, so we can afford to be objective about the benefits of the various materials. This page will be extended to cover the properties of these other materials in due course.... sorry - we are still in development!